Two groups that support a moratorium on construction of new livestock confinements are filing a lawsuit against the State of Iowa — accusing state officials of failing to protect the Raccoon River from contaminants like farm chemicals and manure. 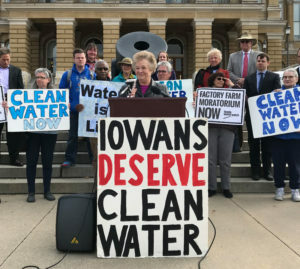 “Our children deserve the freedom to play carefree, as we did, in water that is clean,” said Kimberly Stevens of Nevada, a member of Iowa Citizens for Community Improvement, one of the groups that’s filed the lawsuit. Iowa Citizens for Community Improvement activist Brenda Brink of Huxley joined Stevens and others for a news conference on the statehouse steps to discuss the lawsuit. Brink said the Raccoon River needs attention because it’s the source of drinking water for half a million Iowans. The lawsuit seeks limits on when and how much liquid manure and farm chemicals may be applied on farm fields. Emma Schmidt of Rockwell City is with Food and Water Watch, the other group that’s party to the lawsuit and she called the lawsuit a “momentous step” to force action. 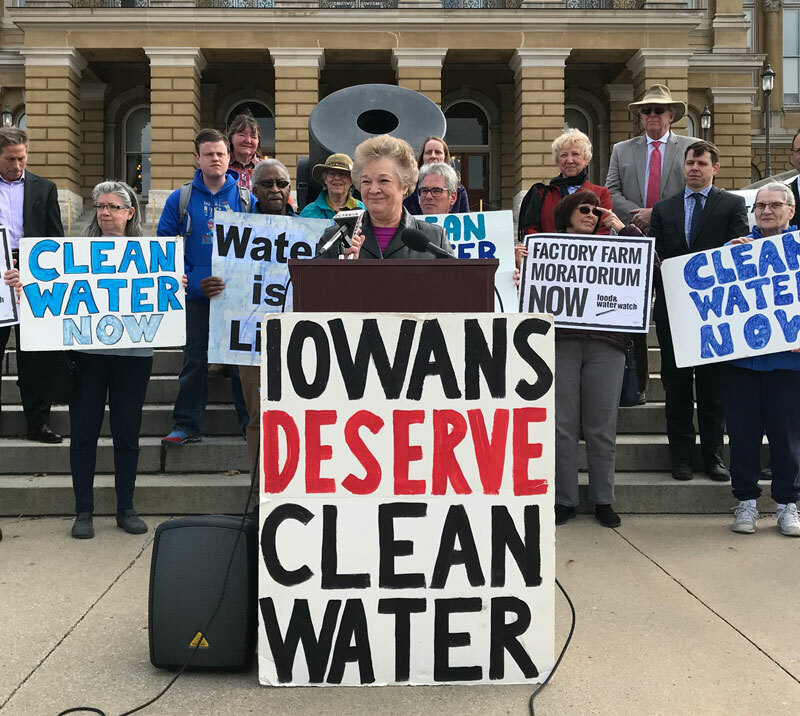 “We’ve tried everything, yet our legislators and our governor are continuing to ignore the fact that industrial agriculture is polluting our water, destroying our rural communities and driving independent family farmers out of the business,” she said. The lawsuit accuses state officials of abdicating control of the state’s waterways to “private interests.” A Des Moines Water Works lawsuit challenging how three northwest Iowa counties managed ag drainage into the Raccoon River was dismissed by a federal judge in 2017. This lawsuit is filed in state court. Iowa Agriculture Secretary Mike Naig said he cannot comment directly on the lawsuit because his agency hasn’t gotten a copy of it yet. Naig said he remains focused on making “measurable progress on soil conservation and water quality” through the voluntary efforts of Iowa farmers.